The day began with cirrostratus areas: some being the reminiscence of tops from thundery showers of the previous day. 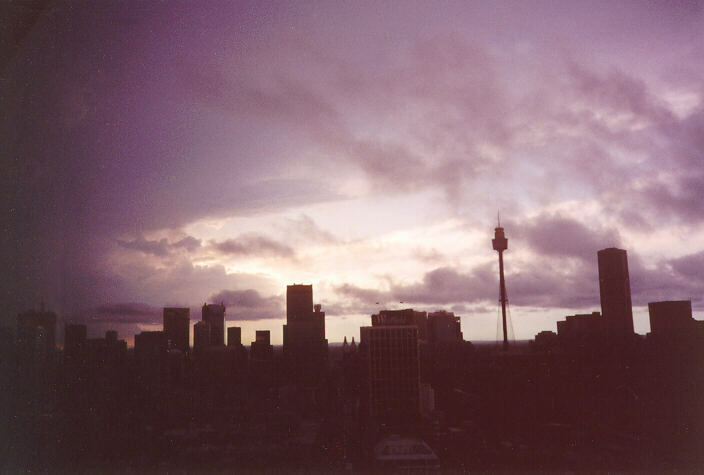 There also was a thick haze, mostly consisting of moisture or pollution, smudging the view to the Blue Mountains. Around midday, cumulus towers to the SW developed into weak thundery showers that dissipated by 1pm. One thundery shower that developed near Richmond persisted and headed east towards the Northern Suburbs. It produced some heavy rain and pea sized hail. An interesting feature of the storm was that low cloud developed at the rear flank below a rain free base and formed into a lowered base. However, it did not appear like a tornado or lowered wall cloud. I decided not to chase this storm but photograph it nevertheless. I also watched the development of two adjacent large thunderstorms to the south off the coast near Wollongong, and to the southwest barely visible through the haze. The rear tops of the anvil of the southern storm, although barely visible, had a rounded like shape and lead me to believe it may be a supercell. The front anvils were facing northeast indicating their line of movement. However, only the anvil of the thunderstorm to the southwest was visible. The time of these observations was around 2:30pm. As this thunderstorm approached, it began to reveal its true features with its tops exploding towards the north. At 3:30pm, I initiated a storm chase and rang my friend Geoff to inform him of the situation (Michael Bath was unfortunately unavailable for this chase). 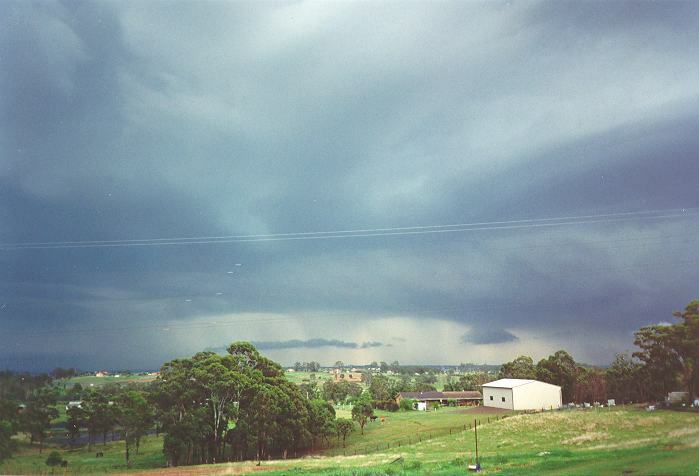 After picking up Geoff, we headed for Rooty Hill to pursue what was promising to be a massive storm. Geoff seemed surprised with this storm to the south as he had focused his attention on the storm to the north. "This storm will definitely have hail in it", I prompted Geoff as I pointed out the expanding tops. 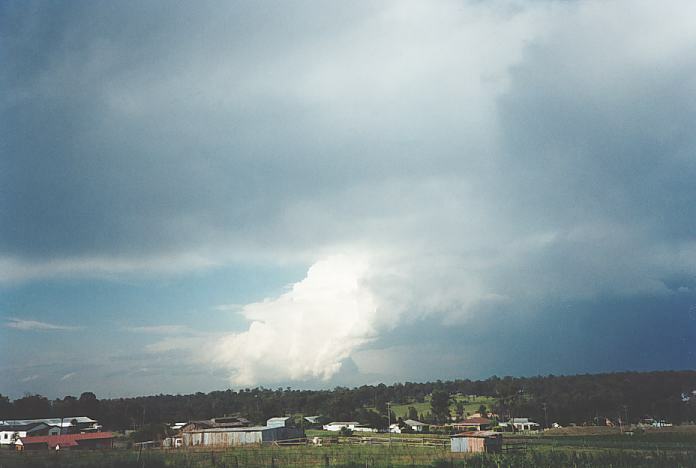 At the top of Rooty Hill, I photographed another storm to the north although it was quite weak. As some low developing stratocumulus cloud obscured the sun, we were able to get a better view of the cloud top with greater contrast. I took several photos of the expanding top but could only fit a very small portion because of its immense size and because we were so close. We then decided to head towards Penrith to locate on the northern side of the storm which is where most wall clouds and tornadoes develop, if any do develop. This proved to be a costly decision in terms of lost time. It also meant we missed out on all the best high contrast photos! As we headed west along the F4 freeway, I also blew the opportunity of heading down Mamre Road towards Kemps Creek as I did not know it headed in that direction. Instead, we travelled further to Penrith and observed a spectacular, high contrast shelf cloud. It was not clear whether there was a wall cloud or not. We turned down the Northern Road, and back east towards Kemps Creek along Elizabeth Drive. The time was about 4:30pm. The storm had intensified dramatically and I kept watch of other thunderstorms rapidly developing to the west and northwest. The last thing you want is to be chased by a storm! As we approached Kemps Creek, we ran into wind squalls and misty drizzle followed by heavy rain and some hail, 2-3cm in diameter. Because of the reduced visibility, I decided to head off Elizabeth Drive and onto Mamre Road (the other end!!!). I told Geoff to look up the street directory for any other roads off Mamre Roads that would take us to some good vantage points as I knew the storm and hail would not affect this region. We travelled off Mamre Road onto Arlington Road and I took further shots of the main tower and precipitation cascade one kilometre away. It also allowed for some breathing space and time to decide our next move. Some low cloud was streaming from this storm and heading into the ones developing to our west, probably around a few hundred metres above the ground. At around 5pm, we decided to continue chasing the storm which was now rapidly heading east. But because of traffic and the fact that the storm by this point had changed direction and increased in speed, we missed out on that opportunity. However, we were able to observe the aftermath of the storm: mostly severe runoff and leaves and twigs stripped from trees indicating some areas of larger sized hail. 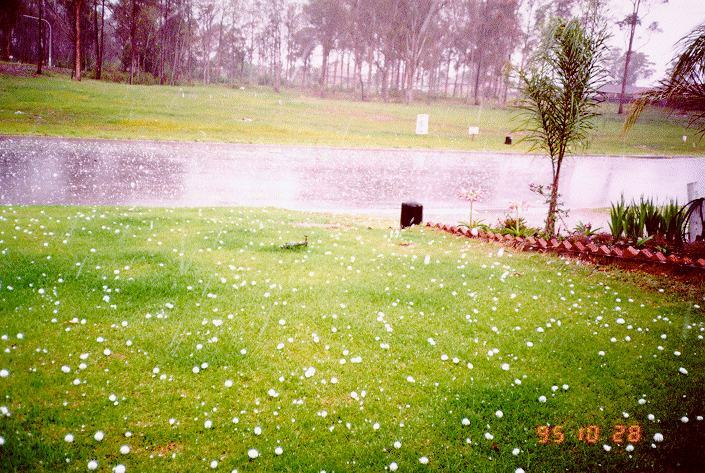 Some hail still lay on the grass or in the bushland. My mind then turned on the darkening skies to our west, and the other approaching thunderstorms. After travelling along Cowpasture Road, we headed west towards Horsely Park along Horsley Drive. It was Geoff's job again to find a high vantage point to our west, and suggested that Jamieson Road would be the go. He was right. This spot allowed us to view the spectacular precipitation cascade and adjacent to it a roll cloud. After a few photos, we decided that the very severe bolts of lightning was enough warning that we should head north along Wallgrove Road and back towards Rooty Hill. This again placed us into an uninteresting and low contrast region of the storm. We passed through some heavy rain around Rooty Hill and Plumpton. At this point, I decided it was best to head for Quakers Hill for some easterly views of the back end of the storm. After a few last photos from Corbin Avenue, we decided that two and half hours was enough, and we headed home. Hail photos by Bert Garcia of Bonnyrigg showing large hail (left) soon after the storm struck, and the quantity of hail (right) towards the end of the event. This storm was significant in many ways. First, backed up by the hook echo observed on radar images by meteorologists at the Bureau of Meteorology, I had earlier observed two separate supercells that had developed and split from one thunderstorm near Picton. This particular storm was what is known as the left mover. ie. it veered to the left as viewed from the rear of the storm. Second, it was the first supercell we had chased, providing us with valuable experience in chasing future potentially more severe supercells in the future. 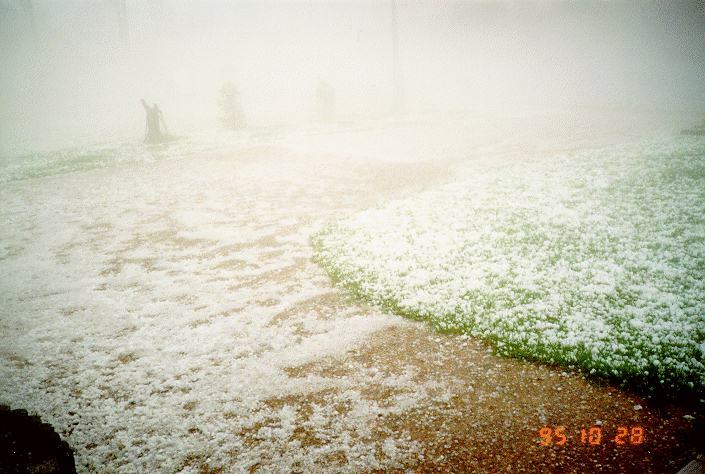 The last supercells to strike the Sydney region were the March 18, 1990 hailstorm that devastated Auburn, and the January 21st 1991 storm that devastated Turramurra. Finally, this storm provided a lesson for observing and identifying future supercell storms. It also allowed me to reflect on previous thunderstorms in the mid 1980's that contained structures resembling this storm. I had always wondered if they were really supercells. Besides the few hiccups of spoiled photographic opportunities, this storm chase was a total success. We were at no time in danger of being chased by the storm.